Our Hanukkah Highlights series is an opportunity for tzevet (staff) from every corner of our community to share their favorite camp memories! 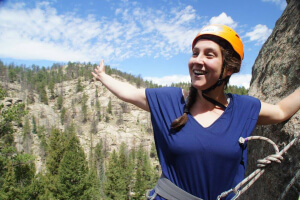 For every day of Hanukkah we will be featuring a different staff member and a different wonderful story about what makes Ramah in the Rockies so special. First up, Danit Cohen! Monday, August 7, 2:24 a.m. It was just a few minutes later that I awoke once more to a voice outside of our ohel (tent) shouting, “Everyone has to wake up, make sure everyone is awake and out of the ohelim. There’s a fire. Get everyone up right now! Strange as it may seem, I wasn’t surprised that the first responders telling me where to go and what to do were my own chalutzim (campers). After all, it was Week 4 of the JOLI Program; I had already witnessed tremendous growth and leadership from these amazing campers. In many ways, the fire that burned down the lodge this summer revealed the strength and determination of our entire community, from the leadership who coordinated our relocation to JCC Ranch camp to the remarkable volunteers who worked tireless to ensure that our campers remained safe and comfortable throughout the transition process. Still, the events of that week definitely took their toll on the staff. Counselors were running on fumes; desperately tired but determined to remain present and optimistic for their campers. It was at this moment that the JOLI chalutzim stepped up to the plate, showcasing the leadership qualities that we had been developing all session. I’ll never forget their faces when we finally got an opportunity to sit down together at the Hebrew Educational Alliance in Denver after the evacuation. We were prepared to support them, hear their concerns, and give them some time to just be campers and hang out together. But these remarkable teenagers had something else in mind: they immediately started suggesting ways they could help the rest of camp. “Can we go to JCC Ranch Camp before everyone else to help set it up?” asked one JOLI chalutz. “We can make signs, give the tours, and be a warm welcome to this new place where they’ll be for the week.” And that is exactly what we did. JOLI made anxious campers feel at ease in a new environment and allowed exhausted tzevet to take a well-deserved break, knowing their chalutzim were in good hands. I often hear people ask, “what do you folks really do in JOLI?” I always answer with this: we build leaders. Those who come through the JOLI program at Ramah in the Rockies leave with the skills, the confidence, and the initiative necessary to be great leaders in their academic, extracurricular, and professional lives. Furthermore, I am certain that when these chalutzim return to camp as staff members in just a few short years, they will be exceptionally prepared to nurture the next generation of Jewish leaders. To learn more about our JOLI Program, click here or email info@ramoutdoors.org.